Mariam received a grant of 300,000 Tz Shillings (£120) in May 2016, in order to buy a calf. Mariam’s husband died several years ago and her life has been very difficult. She cares for a mentally handicapped adult son, and two other teenage children. Recently she has also taken in her late sister-in-law’s two children who are in primary school. She has a smallholding (shamba) but it is not enough to provide for her growing family and so she works as a casual labourer on other farms, planting and weeding. 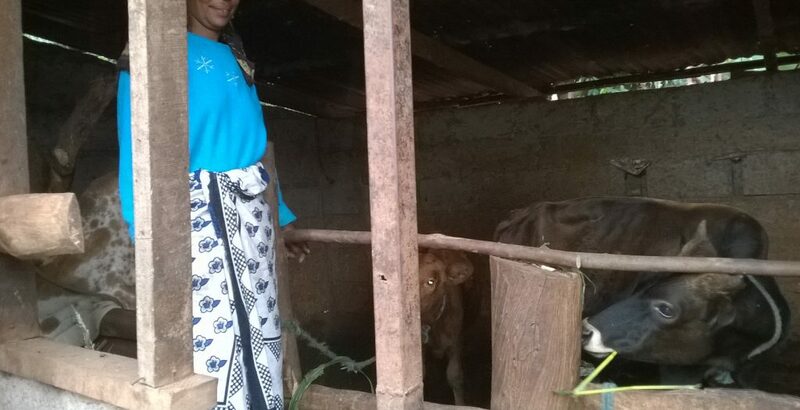 Mariam received a grant of 300,000 Tz shillings last May and used it to buy a part-Jersey calf. The calf is kept with its mother but every day Mariam collects green leaves, maize stalks and grasses from her shamba to feed it. She spends time cleaning the boma where the calf is kept and makes sure there is always fresh drinking water: this is part of the sale agreement. The calf will be kept with its mother until it is fully grown and in November this year, it will be ready to visit the bull. This is obviously a long term project and it will take some time for Mariam to begin to benefit from her planned milk business. However, she is hopeful that this will provide a sustainable income and nutrition for her family for many years to come. If you would like to help support more women like Mariam, we are currently raising funds for our next round of grants and loans. To help us achieve our target you can donate here.